Bring first 6 ingredients and ½ C water to a boil over medium-high heat. Boil gently – honey boils over faster than milk! – stirring often, 1 minute. Remove from heat, and let stand 30 minutes. Meanwhile, peel oranges, next 3 ingredients, and, if desired, kumquats. Cut away bitter white pith. Cut each fruit into thin rounds. 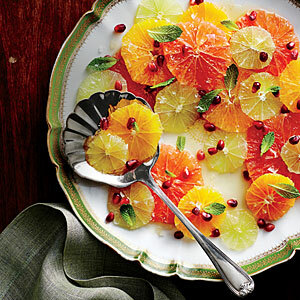 Arrange on a serving platter, and sprinkle with pomegranate seeds. Pour honey mixture through a fine wire-mesh strainer, discarding solids. Drizzle fruit with desired amount of spiced honey; reserve remaining for another use (such as flavoring iced tea). Top with a drizzle of olive oil, a handful of mint leaves, and sea salt. Note: Salad may be made up to a day ahead. Prepare as directed; cover and chill up to 24 hours. Bring to room temperature to serve. This entry was posted in Recipes from Adrienne's pantry, Salads, Sides, Vegetarian and tagged citrus, grapefruit, Honey, lemon, meyer lemon, oranges lime. Bookmark the permalink.